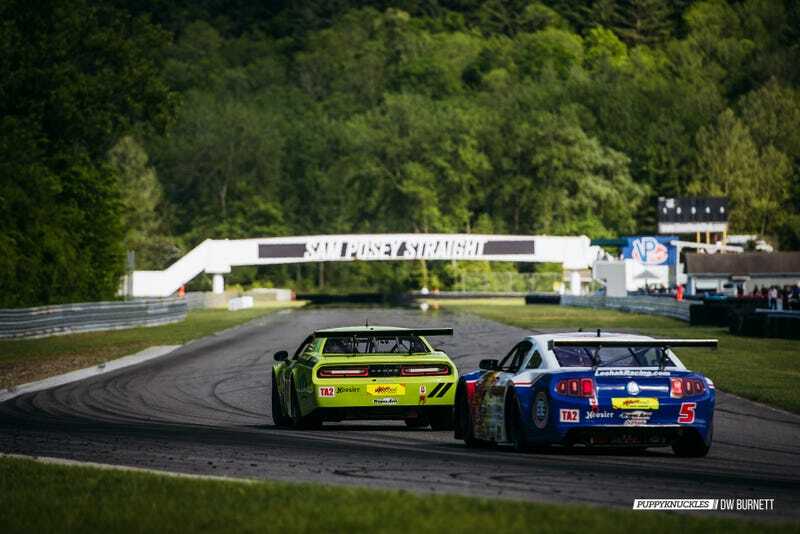 Lime Rock Park kicked off their official season this Memorial Day weekend with a ear splitting bang. The Trans Am series is a fitting high five to American horsepower, and I was there to capture the action at the historic 1.5 mile track. Lime Rock is no stranger to Trans Am racing, having witnessed Sam Posey, Mark Donohue, and Parnelli Jones banging fenders 45 years ago with their legendary Mustangs, Challengers, and Camaros, and, while those beautiful vintage machines still make an appearance on these corners from time to time, they’d be no match for the monsters in modern Trans Am. In the top TA Class this year, they’re running a full tube frame race chassis and 850 naturally aspirated horsepower which made this the fastest field on Lime Rock’s calendar this year. We’re talking lap times of fifty seconds flat, cars almost totally airborne at the top of Uphill, and decibel levels that would drown out Metallica. Oh, yes. ‘Merica! Trans Am has two other classes as well, TA2 and TA3. TA2 are still purpose built racecars, tube chassis, around 500 horsepower V8s, and feature either Mustang, Camaro, or Challenger bodies. The TA2 are the most familiar nod to the Trans Am cars of yore. It was cool to see Adam Andretti in a Mustang in the TA2 field. TA3 is a production model based series, featured Vipers, BMW E46s, Porsche GT3 Cup cars, and Corvettes. Trans Am started originally with production cars in race trim, and it’s nice to see that element is still part of the series. Another big part of the race weekend was the Lime Rock Driver’s Club Spec Miata Championship. You might be tempted to use the Miata races like the drum solo at a Van Halen concert and gone for a hot dog, but then you would have missed some of the most exciting racing all weekend. John Posey piloted his Miata down the Sam Posey straight (named for his legendary dad, who was there watching) for the win. I felt lucky to shoot a quick family photo with them right afterwards. Super close, fun, club racing. The Lime Rock Driver’s Club is a great organization, they put on a great series and is full of friendly drivers and instructors. If you’re serious about getting faster on track and you have the means to join, there’s no better place on the east coast to belong. Finally, there were some vintage races to fill out the afternoons and make for some nice photos. Cars across different eras were on track together, more of a demonstration than actual competition, but it’s always fun to watch old race cars get the beans. Click any thumbnail below for the gallery view. For the complete set of photos from the whole weekend, please visit my photo archives. Thanks for reading!